Olney doc muses: How then SHOULD we work? I’m hugely impressed by this book. Like many Christians of my generation over the last several decades, I have tended towards what some are calling the ‘narrow gospel’. This sees Christianity in somewhat individualistic terms. It’s all about me and God. Worship and witness are what Christianity is all about, after all, ‘This world is not my home I’m just a passing though’, as the old gospel song would have. Well, no, that is not the whole story. Its been something of a slow burn for me over the last 10 years or so, beginning with Tim Keller’s emphasis in his talks on ‘faith and work’, and further helped by Tom Wright's book Surprised by hope, and Charlie Drew in his fine book, A journey worth taking. And then last year going to LICC's Executive Toolbox finally nailed it for me. My work really matters to God. The way I do my work, the way I treat others around me, the opportunities I take to contribute to other peoples flourishing and so much more have filled out my (Christian) life in a way I'd never previously imagined. ‘In the Two Chapter gospel, Chapter One presents our problem: separation from God because of our sin. Chapter Two presents the solution: Jesus Christ has come into the world to bring salvation and reunite us with God through His work on the cross. The renewed emphasis upon Creation as part of God's overarching plan for our world brings with it all sorts of challenges in how we might live as faithful disciples now. It means that there is nothing mundane in God's world (Ok well almost nothing...I mustn't forget Chapter 2:The fall!). My copy has so much underlining if I'm not careful I'll be typing out more thanI should for this blog and fall foul of some copyright laws! It's a brilliant book. Get it and live your live, whether in paid employment or not, as a whole life disciple. 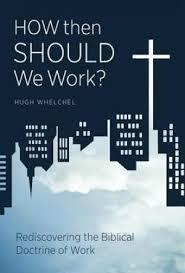 Btw Hugh Whelchel also blogs at the excellent Institute for Faith, Work & Economics.